Hopefully, we go up on Sunday for ascent #7. The first attempt of, hopefully, four this year. The first time I’ve been up since August of 2010. I am brimming with crazy, crazy excitement and nervous energy. I say “hopefully we go up” because you never know. The weather was insane in 2007 and no one was allowed to race. Weather also held us off the mountain for the 2010 practice ride. 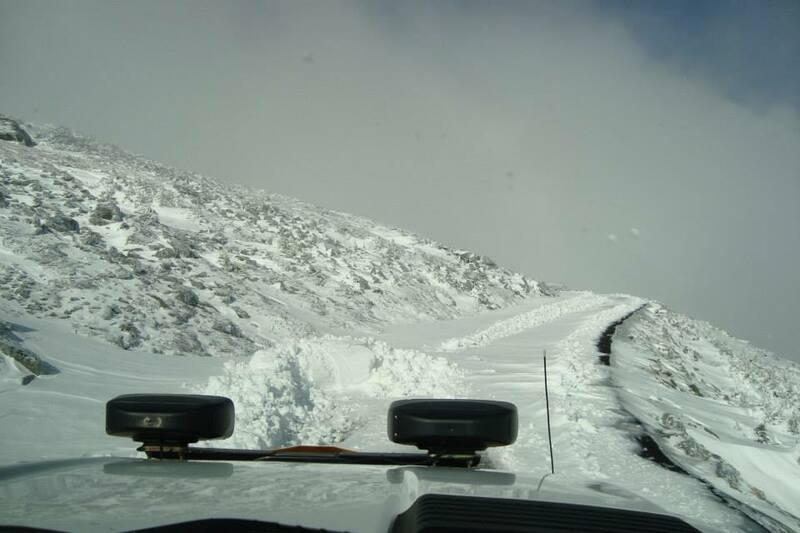 These were the conditions at mile 6 just days ago, courtesy of of the Auto Road Facebook page. In spite of how bad this looks, there is optimism that this week’s dramatic change in weather will make this inconsequential. It’s almost a blessing that my R-Sys wheels blew up on last night’s test ride. My backup wheelset has 25mm Vittorias, which I think are the sweetest rolling tires on the planet. If the dirt at 5 mile hasn’t recovered all that well by Sunday, I’ll be happy to have them. My backup wheel package gives up at least half a pound to my race wheels, but at the moment they actually work. Bike right now with backup wheels and pedals is 15.9 pounds. For race day, I want that in the 14s. Food strategy is very different for the practice rides. You have to be headed up the mountain by 6am, which does not afford time for a proper breakfast. I’m doing something totally untested this time, under Allen’s advisement. I will do the usual weeklong carbo load, and then the night before the race, eat a really big meal. In the middle of the night, I will wake up and drain a protein/carb shake; something on the order of 300-400 calories. Wake up for real at 4am, probably have a coffee, and that’s about it. No food. I may toss something in jersey pocket for insurance, but it shouldn’t be necessary. The plan this time is to negative split the mountain around the 4 mile mark and be full-tilt through the 5 mile grade to the finish. The only way I can think to govern that effort without a Powertap is to go by heart rate, so I will target 165bpm first half (upper Z3) eh maybe 170 even, and settle into the 170s at the split. This is really conservative for me, but it’s important to get this right, since my record for bonking on the mountain is about 50%. Success will be powering through that second half feeling like I could have ramped it up earlier than halfway.